Askew, R.R. (1971) Parasitic Insects. American Elsevier Publishing Co. Inc. 316 pp. Baker, R.R. and Dunn, P.E. (Eds.) (1990) New Directions in Biological Control. Alternatives for suppressing agricultural pests and diseases. Alan R. Liss, Inc., NY. 837pp. Borror, D.J. and White R.E. (1970) A Field Guide to the Insects of America North of Mexico. Houghton Mifflin Co. Boston. 404 pp. Borror, D.J., Triplehorn, C.A., and Johnson, N.F. (1989) An Introduction to the Study of Insects. 6th Edition. Saunders College Pub., Philadelphia. 875 pp. Burgess, H.D. (Ed.) (1981) Microbial Control of Pests and Plant Diseases 1970-1980. Academic Press, 949 pp. Burgess, H.D. and Hussey, N.W. (Eds.) (1971) Microbial Control of Insects and Mites. Academic Press, 861 pp. Carr, A. (1979) Rodale's Color Handbook of Garden Insects. Rodale Press, Emmaus, PA. 241 pp. Cate, J. R. and Hinkle, M.K. (1994) Integrated pest management: The path of a paradigm. National Audobon Society. Washington, DC. 40 pp. Clausen, C.P. (1940) Entomophagous Insects. McGraw-Hill Book Co. Inc., New York. 688 pp. Clausen, C.P. (Ed.) (1978) Introduced parasites and predators of arthropod pests and weeds: A world review. Agricultural Handbook No. 480. USDA Agricultural Research Service. Costello, R.A., Elliot, D.P., Gilkeson, L.A., and Gillespie, D.R. (1992) Integrated Control of Greenhouse Pests for Commercial Growers. Province of British Columbia, Ministry of Agriculture, Fisheries and Food. 19 pp. Croft, B.A. (1990) Arthropod Biological Control Agents and Pesticides. John Wiley & Sons, New York. 723 pp. Davidson, R.H. and Lyon, W.F. (1987) Insect Pests of Farm, Garden, and Orchard. John Wiley & Sons, New York. 640 pp. DeBach, P. and Rosen, D. (1991) Biological Control by Natural Enemies. 2nd ed. Cambridge University Press, New York. 440 pp. Dreistadt, S.H. (1994) Pests of Landscape Trees and Shrubs, An Integrated Pest Management Guide. Statewide IPM Project, University of California, Agriculture and Natural Resources Publication 3359, Oakland, California, U.S.A., 327 pp. Flint, M.L. (1990) Pests of the Garden and Small Farm. A grower's guide to using less pesticide. Univ. California, DANR Publication # 3332. 276 pp. Flint, M. L. and van den Bosch, R. (1981) Introduction to Integrated Pest Management. Plenum Press, New York. 240 pp. Hajak, A. (2004) Natural Enemies: An Introduction to Biological Control. Cambridge University Press, New York. 378 pp. Henn, T. and Weinzierl, R. (1990) Alternatives in insect pest management. Beneficial insects and mites. University of Illinois, Circular 1298, 24 pp. Hoy, M.A., Cunningham, G.L., and Knutson, L. (Eds.) (1987) Biological Control of Pests by Mites. University of California, Berkeley, CA. 185 pp. Hoy, M.A. and Herzog, D.C. (Eds.) (1985) Biological Control in Agricultural IPM Systems. Academic Press, Orlando, FL. 589 pp. Hunter, C.D. (1994) Suppliers of Beneficial Organisms in North America. Calif. Environ. Protection Agency, PM 94-03, 30 pp. Kovach, J., Petzoldt, C., Degni, J., and Tette J. (1992) A method to measure the environmental impact of pesticides. New York Food and Life Sciences Bulletin No. 139. McClay A.S. (Ed.) (1990) Proceedings of the Workshop on Biological Control of Pests in Canada. Alberta Environmental Centre, Calgary, Alberta, Canada. Mahr, D.L. and Ridgway, N.M. (1993) Biological Control of Insects and Mites, An Introduction to Beneficial Natural Enemies and Their Use in Pest Management. University of Wisconsin, Madison, WI 91 pp. Malais, M. and Ravensberg, W.J. (1992) Knowing and Recognizing -- The biology of glasshouse pests and their natural enemies. Koppert Biological Systems, The Netherlands. 110 pp. McKinley R.G. (Ed.) (1992) Vegetable Crop Pests. CRC Press Inc. 386 pp. Nechols, J.R., Andres, L.A., Beardsley, J.W., Goeden, R.D., and Jackson, C.G. (Eds.). (1995) Biological control in the western United States: Accomplishments and benefits of Regional Project W-84, 1964-1989. Univ. of Calif. Press, Division of Agriculture and Natural Resources. 356 pp. Nielsen, G.R. (1985) Predaceous Insects. University of Vermont Extension Service leaflet, EL 52, 2 pp. Nielsen, G.R. (1985) Lady Beetles. University of Vermont Extension Service leaflet, EL 53, 2 pp. Olkowski, W., Daar, S. and Olkowski, H. (1991) Common-Sense Pest Control, Least-Toxics Solutions for Your Home, Garden, Pets and Community. The Taunton Press, Newton, CT. 715 pp. Pedigo, L.P. (1989) Entomology and Pest Management. Macmillan Publishing Company, NY. 646 pp. Raupp, M.J., Van Driesche, R.G., and Davidson, J.A. (1993) Biological Control of Insect and Mite Pests of Woody Landscape Plants: Concepts, Agents and Methods. University of Maryland, College Park, MD 39 pp. Roberts, D.W., Fuxa, J.R., Gaugler, R., Goettel, M., Jaques, R., and Maddox, J. (1990) Use of pathogens in insect control. In: CRC Handbook of Pest Management in Agriculture. 2nd Edition, Vol. II, Pimentel, D. (Ed. ), CRC Press Inc., Boca Raton, FL. pp. 243-278. Steiner, M.Y. and Elliott, D.P. (1987) Biological Pest Management for Interior Plantscapes. 2nd ed. Alberta Environmental Centre, Vegreville, Alberta, Canada. 32 pp. Sweetman, H.L. (1936) The Biological Control of Insects. Comstock Publishing Co. Inc., Ithaca, NY. 461 pp. Tanada, Y., and Kaya, H.K. (1993) Insect Pathology. Academic Press, Inc., San Diego. 666 pp. Thomson W.T. (1992) A Worldwide Guide to Beneficial Animals (insects, mites and nematodes) used for Pest Control Purposes. Thomson Publications, Fresno CA. 92 pp. van den Bosch, R. and Messenger, P.S. (1973) Biological Control. Intext Educational Publishers, NY. 180 pp. Van Driesche, R. and Carey, E. (Eds.) (1987) Opportunities for increased use of biological control in Massachusetts. Mass. Expt. Station, Research Bulletin 718, 141 pp. Van Driesche, R. and Ferro, D.N. (1989) Using biological control in Massachusetts: Colorado potato beetle. Cooperative Extension University of Massachusetts Leaflet L-596. 4 pp. Van Driesche, R. and Ferro, D.N. (1989) Using biological control in Massachusetts: Cole crop Lepidoptera. Cooperative Extension University of Massachusetts Leaflet L-597. 4 pp. 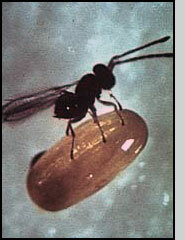 Waage, J. and Greathead, D. (1986) Insect Parasitoids. Academic Press. 389 pp. Watson, A.K. (Ed.) (1993) Biological Control of Weeds Handbook. Weed Science Society of America, Champaign, IL 202 pp. Weinzierl, R. and Henn, T. (1989) Alternatives in insect pest management. Microbial insecticides. University of Illinois, Circular 1295, 12 pp. Ypsen, R.B., Jr. (Ed.) (1984) The Encyclopedia of Natural Insect and Disease Control. Rodale Press, Emmaus, PA. 490 pp.